When your family members are Celiacs (Coelic in Australia) travel is potentially life-threatening so it’s much easier just staying at home. Travel becomes one big hassle, a mountain not worth the trudge. For starters, you can’t trust what goes into meals nor trust that chefs have heard of gluten-free, particularly in Asia. However, if the desire to experience the wonders of the world outweigh your hesitations, preparation and attitude will get you there. The world truly is your gluten-free oyster. Read on. Two out of three of Annabel’s children are Celiacs but this has never prevented her travelling. 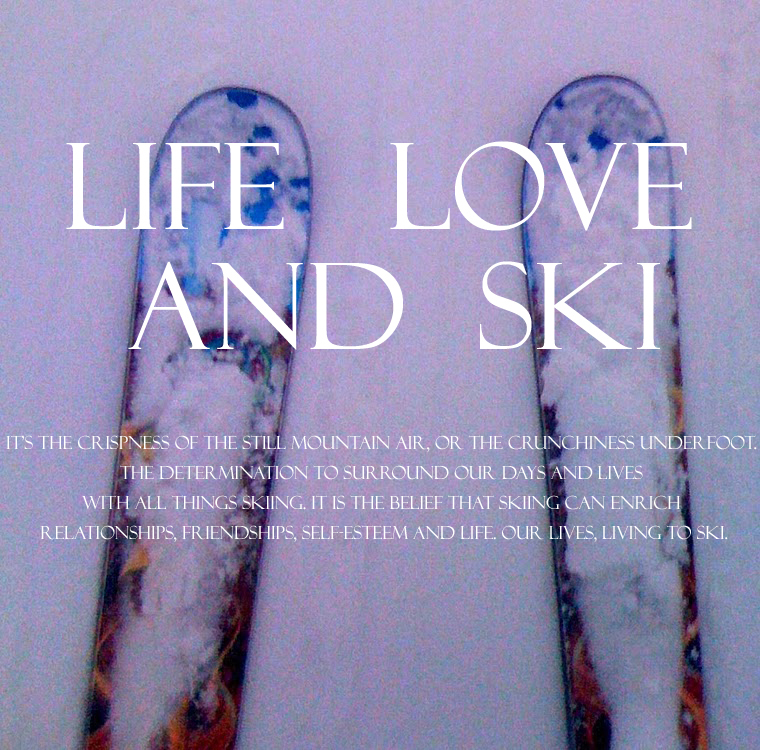 A keen camper and skier from Sydney, Annabel befriends Celiac disease rather than make it her foe. Celiac disease is a reaction some people’s bodies have if they eat foods containing gluten (such as wheat, malt, rye or barley). Their immune system attacks the small intestine, it can be very painful and lead to more deadly problems if left untreated. 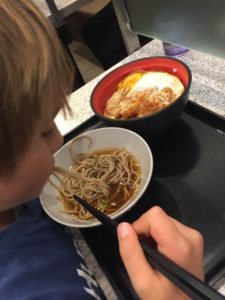 Annabel has family in Japan, so on a previous trip they utilised the skills of a Japanese speaking assistant to call ahead to restaurants, painstakingly explaining to chefs what ingredients they needed to avoid. Arriving to panicked faces of baffled chefs this usually resulted in sumptuous banquet of delicious smelling Japanese food for the family with a boring bowl of steamed rice for the two children who looked sadly on as everyone tucked in. This trip Annabel planned to be more independent and on the front foot, luckily flying with an airline that allowed her to pack an entire suitcase filled with gluten-free options such as tamari sauce (wheat-free alternative to soy sauce), breakfast cereals, pasta, dried noodles and snacks galore. 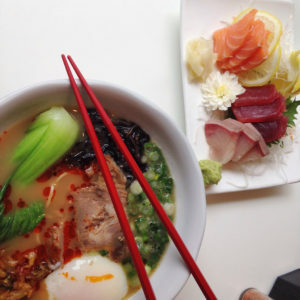 “It’s the sauces that are problematic for gluten-free eaters. I totally recommending taking your own food so you don’t get stuck”. 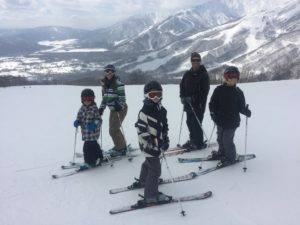 This trip Annabel’s family headed back to ski Hakuba. Often Japanese hotels are simple rooms and accommodation deals come with breakfast included. Japanese breakfast, while delicious and culturally interesting can be loaded with soya sauce, Japanese mayonaise and other sneaky rye, malt or wheat problems. 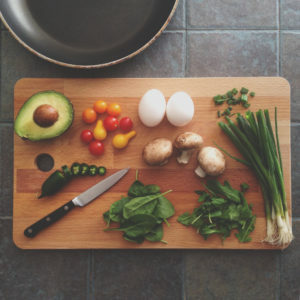 “Staying in self-contained accommodation really helps manage the meals from breakfast through to dinner” Annabel discovered. Staying in a village or ski resort with more westernised eating options is also easier. 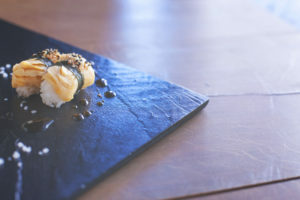 They stayed in a part of Hakuba that had Indian and Mexican restaurants, firmer corn taco and tortilla shells better for Celiacs than sushi or gyoza gluten-filled options. Sashimi (raw fish) is fine as long as soy sauce isn’t poured over it, good sushi options are plain salmon or cucumber. Egg is best avoided as mayonnaise is often mixed for consistency. Soba noodles are fine because they’re buckwheat, but the accompanying sauce can be an issue. Annabel found it easiest to cook chicken, fish and meat meals for her children in their accommodation. 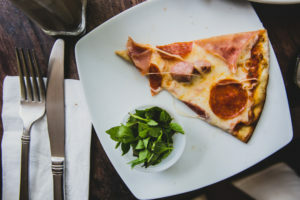 She took gluten-free pizza bases and tomato paste to make pizzas for the kids, buying cheese and ham for toppings in the local mini-mart. Fruit such as apples and bananas are readily available in mini-mart, seven-eleven style supermarkets peppered around hotel areas or villages. 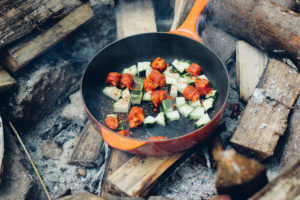 When everyone is on vacation there’s a fun element in the air, everyone lets their hair down, bedtimes are more relaxed and treats sneak into the diet that aren’t usually regular family food choices. “For a day on the ski slopes we packed a backpack with lots of crappy food they wouldn’t have at home. They had Freddo frogs, sugar-laden fruit muesli bars, gluten-free Up-and-Go drinks and other treats like lollies or toys”, Annabel was satisfied skiing was burning off junk food calories and she wanted her kids to have a few food surprises to get excited about. Hot chocolate, a staple treat in any ski resort can be problematic if laden with malt or barley. A home-made hot chocolate in a thermos can get around the problem. The occasional soft drink from a vending machine gave her kids that ‘holiday feeling’. 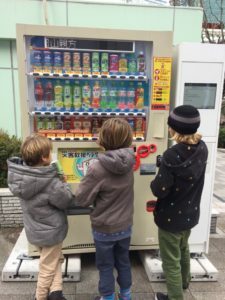 Like any western kids in a Japanese ski resort there’s a thrill to putting coins in the multitude of Japanese drink machines, working out the currency and making a selection. The downside of Japanese cuisine is gluten-filled sauces but the upside is the Japanese culture of safety, trust and near-zero crime. Leave a backpack filled with gluten-free snacks in a corner of the ski resort cafeteria or locker room and there’s little chance anyone will take it or even touch it. Purchase a gluten-free information card before your trip to carry on you in transit at meal time is a big help if you don’t have your own gluten-free food. 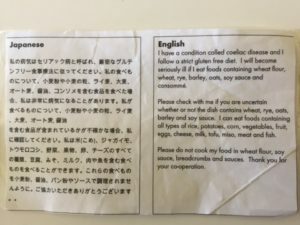 “Download the google translate app, hold your smart phone over the Japanese ingredient list on packets to work out what’s in your packaged food” are other recommendations Annabel lived by on her trip. She also discovered between this trip and the trip prior that capital cities (like Tokyo) have become more global, demand for gluten-free food resulting in substantial gluten-free sections of supermarkets frequented by expats. 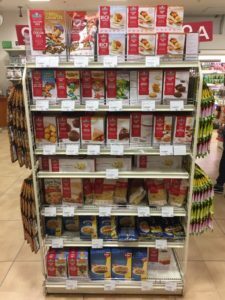 “The supermarket chain Nissen had a great range of pasta, cake mix, cookies and crackers, it’s worth researching beforehand if your trip includes a stopover in a capital city”. You may have to plan like an event planning ninja but with the right attitude and these fairly simple yet crucial steps in place your family won’t even notice what they missed. Give yourself a gluten-free five! Failing that there’s always North America for chicken wings. Who says you can’t eat them every day for a month? Or there’s always the child-free sprint to Whistler. Would love to have you stay with us at Chalet Madarao or Chalet Myoko. Chalet Madarao has an in house restaurant and we happily cater to special dietary requirements. Chalet Myoko is self cater and we will take you to the local supermarket or help you get the foods you need.